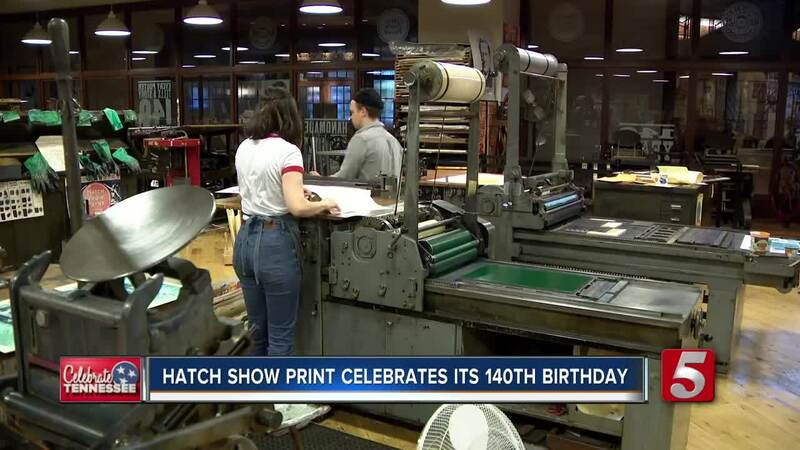 NASHVILLE, Tenn. (WTVF) — Nashville's iconic Hatch Show Print celebrated its 140th birthday. It's one of the oldest businesses in Nashville and one of the oldest letter press businesses in the country. "We were born forty years before country music," said Celene Aubry. They still use hand carved wooden blocks to produce posters that are much more than advertisements. "The posters don't need to tell you something ahead of time. We now design them to commemorate the experience that you have when you come to a live show, special event," she said. The shop has eight full time designer printers on staff, and they print more than 200,000 posters a year. The shop is located inside the Country music hall of fame and museum - their home since 1992. "We take history very serious at the museum and this shop is important to cultural legacy of this city and country music," said Aubry. Aubry is the first female shop manager in all those years and is committed to the integrity of the art. It is the ultimate Nashville souvenir and they hope every one ends up on a wall somewhere.